California Institute of the Arts (CalArts) co-published Afterall from 2002-2009. This essay was originally published for Afterall Online in 2008, and is reprinted with permission from the author. All original formatting has been preserved. 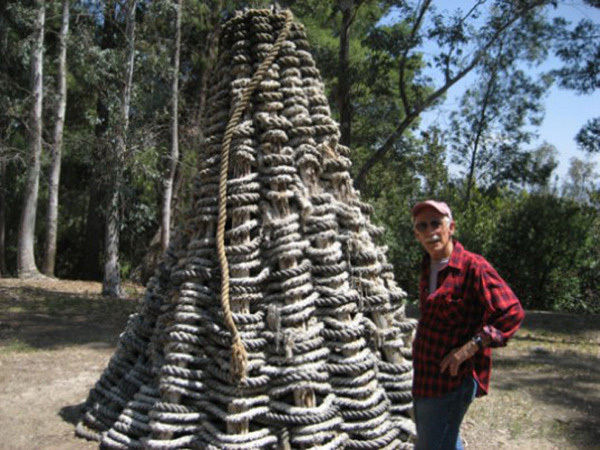 Lloyd Hamrol and his sculpture Woven Cone (1973) at California Institute of the Arts, Valencia, California on May 22, 2007. Photo by the author. In 1973, artist Lloyd Hamrol and a group of students constructed Woven Cone, a teepee shaped rope sculpture, on a rise overlooking the rear parking area of the CalArts campus in Valencia, CA. The piece stood there as an iconic presence until this past summer, when it was dismantled following the discovery of a severe termite infestation. Hamrol came to the campus to remember his experiences as a faculty member in the School of Art during the formative period of the early 1970s. There was an earthquake in Valencia in 1971, which cracked some of the buildings open, making the area unsafe. We moved classes to a temporary location in Villa Cabrini in Van Nuys, while the new campus was being repaired and completed. It was a great playtime. It was really free fall. That same year, CalArts’ endowment collapsed. There had been a lot of money around before then. What happened was that there was a stock market adjustment; there was a lot of railroad stock in the endowment and the railroads took a dive. By the early 70s, the school was in bad trouble with the value of stock dropping and the value of the endowment starting to dry up. The administration’s policy for admission began to change. The school couldn’t offer scholarships and they wanted more people to come in who could pay, to take some of the burden off of them. That meant they had to begin adjusting the criteria for acceptance, and everyone was not having fun with that. Faculty didn’t know quite where to go and they felt more obliged to guarantee parents that their students were going to really learn something that would grant them a skill that would allow them to get a good job when they got out. Some of the painters were persuaded that this was going to be summer camp for the big time in New York. It was like spring training. So what was this stuff that Hamrol was doing – what was this horseplay? Well, in the first year at Villa Cabrini, horseplay was great; it was good to play. I thought playing was the whole intention. But, once we moved into the new building in 1973 and started to settle in, we began to see the adjustments that were being made. This building was expensive to operate, especially running the air conditioning during hot days. Then they started renting the CalArts campus to movie production companies. You’d come to campus one day and half the bottom floor would be blocked off because they were shooting a movie. CalArts became a hard place in which to play. We had to start knuckling down. I wasn’t that kind of a person. My idea was to expose the students to as many off-the-path, off-the-track alternatives to the canon that I could possibly find. I thought that was why they were here. If they wanted to learn drawing or serious sculpture making, they could work with other faculty. The landscape around CalArts was very different then. You could look right down the hill to the bedroom community of Valencia, which was new at the time. It was pretty unattractive in many ways; a little island universe within a very conservative community. There was often tension between the students and the residents and the businesses. The kids had concerns about being isolated. Some had come from New York City or New Jersey or another urban environment, and they felt a little estranged here. They wanted to partake of a larger, major culture. In part, that’s why I wanted to get them off campus and back into the neighborhood, into the fabric of the community. I would work with students in two ways: one was to come to the class and say, ‘I have this idea I’d like to do. Would you like to get involved?’ The other was to just talk and sometimes I would ask them to write stories about themselves. We’d talk about them and I’d try to nail down some of their concerns and interests. They knew what was going on in the atelier context – the studios, the painting, and so forth. And they came into this class because they wanted to do something else. So we talked about social service and whether there was a line between practicality and symbolism. How do you reconcile or resolve what seem to be apparent dichotomies or totally incompatible ends without simply being Habitat for Humanity? The idea of ‘giving’ was a benchmark for many of our discussions. We talked about the notion of giving to one’s self when making artwork. We also discussed if there was a point at which you could make work and give to others at the same time. These questions fueled our approach to art-making. I had my students write biographical essays, and from them we created this little village out of mud and earth, using primitive building techniques like rammed earth, adobe clay, and thatch. Each person had a structural analog of their biography in the village. We constructed paths between these places. These were like individual marks in the landscape that had a linkage as a community. And when the students shared materials, in a sense, they shared a certain ethos and a culture. In my Environmental Workshop class, my students and I did a project in a shopping mall in Van Nuys. We set up a trailer, called ‘The Fantasy Photo Trailer’, which we outfitted like a prop shop to set up environments. We collected a lot of old clothes and quasi-costumey stuff. Over the course of a few weeks, we painted all sorts of strange, flat theatrical props in one of the shops at CalArts, like a ship, a dock, pelicans, mountains and the Statue of Liberty. We opened the door to the trailer and set out some fliers. People at the mall came out of curiosity to see what we were doing and we invited them in to explore fantasy with us. We dressed them in costumes, put them in front of the various props and took their pictures with Polaroid cameras. We gave away some and kept some. Once, we went to MacArthur Park in downtown Los Angeles and put together a celebration for George Washington’s birthday. For that project, we used the CalArts cafeteria kitchen and baked bread and turkeys with the cafeteria staff. We took a trailer full of folding tables and chairs down to MacArthur Park and we set them up like a long table and put up bunting and decorations that said, ‘Happy Birthday George Washington’. And people came out of the bushes. The park has been cleaned up since the 1980s but back then there were a lot of homeless living there and they were astounded. We basically fed the homeless that day. That was something they were all really excited about doing; the idea of some kind of social benefit was interesting to them. They were very excited about that. My class and I also once rented a storefront in Van Nuys to do a project based on the idea of used cars. Van Nuys was the center of the used car market in the Valley, so we bought a wreck out of a junkyard. It was a totaled MG Coupe, an old sports car, in which somebody had died. In the glove compartment was a cassette tape of ‘Amazing Grace’ which freaked everybody out. Once we set up the car, we got a neon sign that said ‘USED CARS’ to put up in the window, lit up at night. We hung a green curtain behind the window, and the wreck of a car was jacked up with a pulley, half off the floor. We put sod under it so that the car was rising up out of grass. We got some live rabbits, but we took them out after a while because they obviously wouldn’t last very long. In the store’s little entry alcove between the two windows, we installed a speaker and tape player to play the ‘Amazing Grace’ cassette. It was like an Easter offering, with a resurrected black car and rabbits running around on the sod. In anticipation of building the Woven Cone sculpture, I came to the students with an idea. I said, ‘Here’s this project I’d like to do, and would you like to be involved in this project?’ And they said, ‘Oh, yeah’. So we went up to Mendocino County, where I knew someone who managed a little redwood farm, and he let us fell redwood saplings for the piece. It was like a CalArts woodland camping trip. There were three kids and myself, in a 14-foot covered truck, driving up to Mendocino. My friend put us up for the night in his cabin and we had fresh hens’ eggs in the morning. We spent the better part of the day going through his woods, finding the saplings and cutting them down. We stuffed the truck full and brought them back here to the Super Shop and started skinning the trees outside. People began scratching and itching—it turns out that we had dragged the trees through poison oak. The students worked with shovels, digging holes, setting posts, and creating a little jig at the top that was a disc of plywood with little half-holes cut in it like cogs in a wheel, which became the template where the tops of the posts would rest. That was nailed to the center post, so we centered it first and leaned the posts against the template so that we were able to dig our post-holes and keep them in place while we started weaving the piece together. For the weave, we used old ship’s ropes, which we found down at the harbor area. Ultimately, we got high enough where we could pull out the support structure and finish it up. It was woven over and under, and then under and over, so it had a cross wrap. It had a great simplicity of form with this kind of basket weaving and cone shape. People used to think of it as a teepee because you could climb in over the top and drop down. It was harder to get out because you had to get out on the inclined side, where you have more gravity working against you, but it was possible. It had this interior life. When you went in there, it became this strange sanctuary, like a prison, but also like a shelter or a sanctum. I went in there a few times. It was quite a revelation to do that, in order to see someone go in there and disappear inside. No one would know if you were in there – it wasn’t possible to see in it very easily. You could observe the life around you in a kind of voyeuristic fantasy. It has lasted thirty-three years, or rather endured a slow and steady process of decay. It’s made of a combination of industrial and natural materials. The wooden parts are decaying naturally—they’ve been bug-eaten and are finding their way back to the soil. The rope, on the other hand, is synthetic polypropylene, but it has broken apart and the nails that held it in place are rusting and dissolving in the atmosphere. Woven Cone resolved certain issues I was involved with as an artist, particularly working contrary to canons of history that glorify a fixed monument in the landscape without taking into account the environmental context. I felt that there was a real value in stepping outside of the industrial, urban cultural landscape. I come from a family of craftspeople, people who worked with their hands. They were tailors and carpenters and amateur musicians and people who sat at something and worked with scissors, knives and other simple tools. I know that this had a bearing on my outlook. My grandmother was a fantastic seamstress and she used to design her own clothes. She could have been a professional, I guess, but her circumstances never allowed her to do that. She was so good. I used to watch her at the sewing machine all the time. She was just an expert, and I loved that. I know that has played a real role in shaping my self-perception as an artist and the values that I have. In the early 1970s, I was on the road to working more in public spaces outdoors, in contextual and sited situations. Those later works had greater permanence and weren’t made with such self-destructive potential. In terms of the land-based conceptual art being made by people like Robert Smithson and Michael Heizer, I was more interested in intimacy and a level of emotional content that I didn’t find present in those works. I was equally interested in the so-called ‘craft’ traditions of folk art. My wife at the time, Judy Chicago, was also involved in investigating these skills, practices and traditions that belonged to women, largely, which were not granted high status—china painting, tapestry weaving, and so forth. From a practical and functional standpoint, the sculpture drew more on folk art and native art, so it stood apart from the land-based conceptualists and their intentions and enterprises. Woven Cone was built in 1973, when the Feminist Art Program here was very strong. That meant people were interested in confronting the masculine idea of the monument and image making, and counter-proposing the idea of participation and a democracy of involvement in an enterprise that involved more than one. It was really a great time, so, for me, the sculpture was a kind of androgynous form that was both masculine and feminine, reflecting the zeitgeist of the moment. On the one hand, it was an upright, priapic, thrusting form in the landscape. But it also had a soft, penetrable surface, and internal space. Little glints of light would come through the weaving’s interstices, giving it a nest-like quality. At the time of the Feminist art program, there was something in the air; you could not avoid bumping into it or encountering it at some level. There was all this interesting aggravation in the air, within the school of thought. That period during the early 1970s was a difficult time with a lot of militancy, righteousness and separatism. For example, there were those who believed that a woman couldn’t be both married and feminist. I participated in a men’s consciousness raising group that took place at the CalArts campus, a group that was generated out of the issues of feminist objectives and intended to look into men’s historical and future roles in relationship to those of women. These were really interesting issues but we never got very far with this group. I felt ultimately that I had to make a personal decision whether to allow myself to be swept up in a mass movement. What difference did it make, whether you became a Hegelian Marxist or not? Ultimately, it’s about power. Either someone has it and you want it, or you want to dismantle theirs so that you can ‘share’ it. But the process gets a little muddy because the opportunity to have power is very seductive. And once you have some power it can be hard to be fair if you feel you’ve been stepped on and want to seek restitution. It’s difficult to have historical perspective when you realize that you might be riding the crest of a really important wave with truth embedded in it. It’s like, ‘Oh, I see it now. And everyone else should see it too’. When you’re in the midst of this kind of passionate enthusiasm, you’re in a sense self-blinded. All you can see is your own enthusiasm for the idea and what you believe to be an incontrovertible fact of life and a formula for a better world. The Feminist movement was not a hippie movement. It shared some historical energy with that rejection of the middle class value system, but it was taking place in academia with people who were fiercely professional. They were interested in exploring and challenging male dominance and the cultural values that made that possible. They were not about ‘going back to the land’. But in certain ways, I was ‘going back to the land’. Perhaps I was like a reconstituted hippie, in my own way. I had to strike my own path. Audrey Chan is a Los Angeles-based artist and writer. Her essays and interviews have appeared in Afterall Online, Art21 Blog, and …might be good. Her first book, Conseil juridique et artistique / Legal and Artistic Counsel (2011), concerns the relationship between art and politics in French law.